As part of China's opening up drive in the new era, the Belt and Road Initiative (BRI) has aroused interest around the world and won widespread international participation as a result of its inclusive, win-win nature. When he delivered the government work report at the the 13th National People's Congress (NPC) on March 5, Premier Li Keqiang pointed out that China's opening up has occurred on all fronts, and that joint efforts to pursue the BRI were setting a new pace. Mechanisms of cooperation for countries along the BRI routes are improving, and trade, cultural and people-to-people exchanges under the initiative have gathered momentum. Joint construction of the BRI will continue to be a major measure of China's opening up. 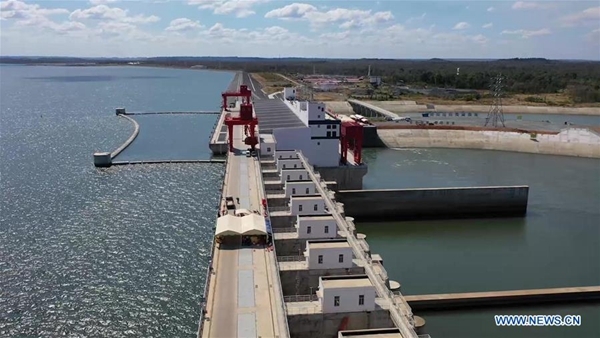 The 19th Communist Party of China (CPC) National Congress report pointed out that China should prioritize joint construction, give equal emphasis to "bringing in" and "going global," follow the principle of achieving shared growth through discussion and collaboration, and increase openness and cooperation in innovation. The BRI has already created concrete results related to "bringing in" and "going global." According to data from the National Development and Reform Commission, of the 279 items on the outcomes list released at the inaugural 2017 Belt and Road Forum for International Cooperation (BRF), 269 had been completed by the end of last year. The remaining 10 items are advancing, and will be in action by the time of the second BRF, to be held in April 2019. Meanwhile, trade volume is expanding. China has made significant achievements with the countries and regions involved in the BRI in the past five years, with total trade volumes between China and those regions exceeding US$6 trillion. China's outbound direct investment (ODI) into BRI countries is also increasing. According to official data from the Ministry of Commerce, non-financial direct investment by Chinese enterprises in 56 countries along the Belt and Road routes reached US$15.64 billion in 2018, up 8.9 percent year over year, accounting for 13 percent of the total volume in the same period. In 2018, a large number of countries signed onto BRI – particularly in Africa, where China signed memorandums of understanding with 37 countries or regions at the Forum on China-Africa Cooperation in September 2018. The importance of outbound economic and trade cooperation zones is also growing. By the end of 2018, a total of 933 enterprises passed confirmation assessment to enter cooperation zones. The accumulated investment was US$20.96 billion, with US$2.28 billion being handed over in taxes and dues. Additionally, 147,000 jobs were created, realizing mutual beneficial results. Lastly, cooperation in third-party markets was promoted. Chinese enterprises conducted practical cooperation in Asia and Africa, by working together with enterprises from the U.K., Germany, France and Singapore. The BRI offers new solutions to meet the demand for change in the global governance system. Jointly building the BRI has the important effects of upholding justice and friendship while pursuing shared interests through diplomatic work, especially the reform of the global governance system. The BRI is not a one-way promotion of the Chinese model; instead, it promotes the safeguarding of national interests and the benefit to all economies involved in the initiative. The 19th CPC National Congress report emphasized that China has made generalized efforts in the pursuit of major country diplomacy with Chinese characteristics, thus advancing its diplomatic agenda in a comprehensive, multifaceted manner. Since the BRI was proposed in 2013, China has signed 171 cooperation documents with 29 international organizations and 123 countries, including developed and developing countries. 2019 marks the 70th anniversary of the founding of the People's Republic of China. The second Belt and Road Forum for International Cooperation will be held this April, with the theme "Belt and Road Cooperation: Shaping a Brighter Shared Future." The forum aims to enable high-quality cooperation, striving for green and sustainable development. Wang Yi said on the sidelines of the 2019 National People's Congress session that China will seek greater synergy with participating countries and their development strategies, will promote implementation of the UN 2030 Agenda for Sustainable Development, and will emphasize the improvement of people's lives while deepening cooperation. China will strive to uphold open cooperation, support economic globalization and multilateralism, and join hands with its partners to build an open global economy. In a nut shell, as the 19th CPC National Congress report concluded, China has made great contributions to global peace and development, and will continue to do so in the future, as it champions the development of a community with a shared future for mankind. The author is Associate Research Fellow with Chongyang Institute for Financial Studies, Renmin University of China. Joint construction of the Belt and Road will continue to be a major measure of China's opening up in the new era.